The JSHO was announced after the meeting of the Friends of Health in Laurel, Md. USA, 2005. 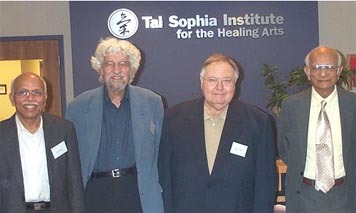 Among the Editors present on the occasion were (L to R) Professor B. M. Hegde; Hans Peter Duerr, Emeritus President Max Planck Institute, Munich, Germany; Professor Joie Jones, Professor of Radiology and Radiobiology, University of California in Irvine; Professor Rustum Roy.